Because our Freshness Farms delivery includes arugula this week, we substituted the peppery leaves in our pesto (3/4 bunch or 2 heaping, packed cups). We added one teaspoon lemon juice and 1/4 cup Parmesan cheese to balance the herb’s assertive edge—the cheese means the dish is no longer dairy-free, so leave it out if you prefer. Our only disappointment with Chloé’s meal: there were no left-overs. When Ann invited me to be a guest writer a few months ago, I was honored and excited. I am grateful for the opportunity to share one of my homegrown creations with such a passionate audience – a group of people brought together by a shared love for cooking with the seasons and for supporting local, sustainable agriculture. Thank you for your commitment to your health and to your community: the ripple effects are felt around the world. Ann and I share a love for vegetables! We also share an approach to preparing them that is simple, delicious, and features the vegetables themselves as the jewels of the meal. We have found that this method appeals to people of all ages and eating persuasions. See, Ann’s family is vegetarian. I eat meat. And I don’t eat wheat or gluten. In spite of these differences, we share a lot of common ground, and I have always thoroughly enjoyed the beautiful and bountiful meals we have shared. In fact, I don’t find eating gluten-free to be challenging (just as I’m sure Ann’s family doesn’t find being vegetarian challenging), and I want to share a few of my tips and tricks with you, in case you are also gluten-free or are considering experimenting with eating less wheat or fewer grains. Focus on the veggies. The one thing that all modes of healthy, intentional eating can agree on – from vegan to paleo and everything in between – is that eating a lot of organic, local, seasonal vegetables is a good thing. Add a side of meat or a side of a gluten-free grain. Learn how to cook gluten-free grains. Have you heard of quinoa, amaranth, teff, millet, or buckwheat? Rice is gluten-free, too. I will show you how to cook quinoa in this post to get you started. Seek out the ethnic cuisines that are naturally gluten-free. For at-home cooking and for eating out, focus on dishes that start with rice or corn instead of wheat or bread. It’s pretty simple to stay gluten-free when you look to Mexican, Indian, Thai, and Vietnamese dishes. For Italian food, try a risotto. It’s simply (or not so simply) a matter of re-training your brain. And now for the recipe. Pesto. It typically goes with pasta. Does that have to be the rule? No, let’s break it! Today, we are going to put our pesto on veggies. And, if you like, on quinoa. I like making up recipes based on what I find at the market. This past week, after a trip to New York City, I was eternally happy to be back in San Francisco, riding the office bike to the Tuesday lunch time Farmer’s Market at the Ferry Building. Sunshine, fresh ocean air, beautiful blue skies, and seasonal veggies – sounds like paradise to me. 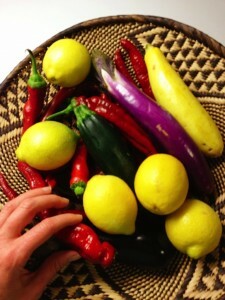 At one stand, I found zucchini, yellow squash, Italian eggplant, and Japanese eggplant. They had American eggplant, too, but I liked how the other eggplants had shapes more similar to the oblong squashes. I look for shapes (this time matching) and color (this time contrasting). Then, this basket of bright red peppers surprised me! It looked like a crackling fire. After checking that these were not hot peppers, I added them to the bag. More parallel shapes and contrasting colors. Yes. Basil and walnuts came next. And that was it – everything we need for a delicious meal. Olive oil, garlic, sea salt, and quinoa are in the pantry at home. The raw walnuts and quinoa in this recipe are soaked for at least 6 hours or overnight to remove lectins—natural protective coatings (nature’s pesticides) that can be hard to digest. Soaking grains also causes them to sprout which increases their nutritional potency. In addition, soaked grains take less time to cook. Soaked nuts are softer and therefore easier to blend. 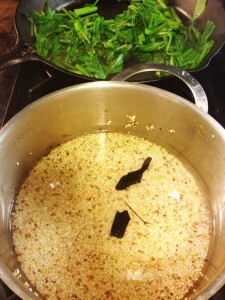 I add kombu seaweed when I cook grains which increases my ability to assimilate them. Next time you are at Rainbow Grocery in the city or a similar bulk health foods store, check out the seaweed section and pick some up! Heat the oven to 400 degrees. Rinse the veggies. Cut off the top and bottom of the zucchini, yellow squash, and eggplants. 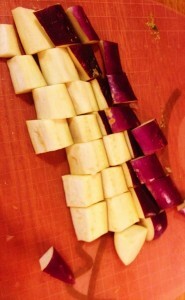 Then cut them in quarters, lengthwise. Dice the quartered veggies into approximately ½ inch pieces (photo top right). Place squashes, eggplant and peppers in a glass pyrex pan (or roasting pan). Drizzle with olive oil and season with a sprinkling of sea salt. Place pan in the oven and roast for 25-35 minutes, stirring every 10 minutes or so, until vegetables are cooked through and browned. While the vegetables are roasting, drain the soaked quinoa, then rinse under running water and drain again (use a finely-woven sieve or strainer). Place the quinoa in a small saucepan (photo bottom right) and add enough water to cover the grains and then a touch more. With or without the seaweed (see headnote), bring the grains to a boil. Reduce heat and simmer for 5-10 minutes, or until the water has been absorbed by the grains and you can see a halo around the ‘orb’ of the quinoa. The grains should be soft and easy to bite. If they are crunchy, add more water and continue to cook. (If you didn’t have a chance to soak your grains ahead of time, you can simply add more water to the pan using the ratio of 2 times the measurement of the grain for the water (e.g. 2 cups water to 1 cup grain) and extend the cooking time to 20 minutes. While the vegetables are roasting and grains are cooking, prepare the pesto. Rinse the basil or arugula leaves. Place the leaves, soaked and rinsed walnuts, 2 cloves garlic, and 1/3 cup olive oil in your blender or food processor. Blend until smooth. Add more oil (up to a 1/2 cup total for the entire recipe) as needed for a smooth consistency. Taste. Add a few pinches of sea salt and freshly ground pepper as needed. Congratulations, you have prepared yourself a healthy gluten-free meal of roasted seasonal veggies, freshly made pesto, and soaked whole grains. Now for the fun part! Find your best bowls for beautiful presentation. Place the veggies in one or more of the bowls. Top with pesto. 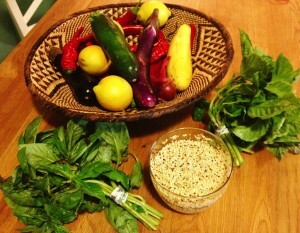 Add the grains to another bowel and garnish with a basil leaf. For people who may be eating grain-free, I recommend serving this with pork sliders or roast beef. If you have leftovers, I recommend creating a salad. Top your favorite salad greens with the leftover roasted veggies, quinoa, and pesto. Voila! Another delicious meal. Many thanks to Ann for this forum, and to you, readers, for your time and interest. E. Chloé Lauer, founder of Zest for Life Today, is a certified holistic health coach, yoga teacher, and urban planning strategist with MKThink. Her recent ebook, The 14-Day Easy Elimination Diet, is a clear guide for clean eating and a supportive tool for diagnosing potential food allergies. The preceding recipe, developed for Four Cooking Together, is consistent with the protocols for the Elimination Diet, gluten-free and dairy-free diets, vegetarians, vegans, and paleo folks (just ignore the quinoa portion!). Preceding article and accompanying photos (excluding lead photo) copyright, E. Chloé Lauer at Zest for Life Today. 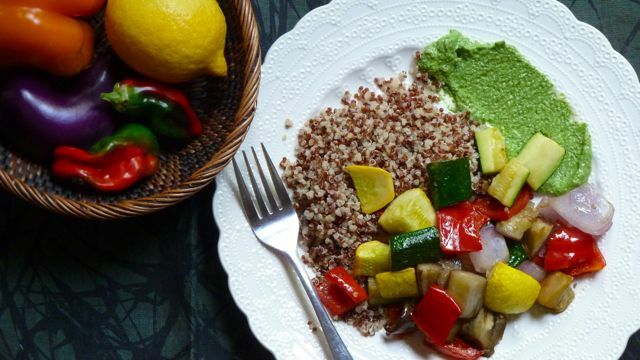 This entry was posted in Journal, Recipes and tagged basil, bell pepper, eggplant, gluten-free, quinoa, vegan, zucchini by Four Cooking Together. Bookmark the permalink.